You’ve probably heard it more than once: drink more water to help you lose more weight. But does water really help weight loss? The short answer is yes. Drinking water helps boost your metabolism, cleanse your body of waste and acts as an appetite suppressant. Also, drinking more water helps your body stop retaining water, leading you to drop those extra pounds of water weight. So what can you do to make sure you’re drinking the recommended eight-to-10 8-ounce glasses per day to keep yourself hydrated and encourage weight loss? Because water is an appetite suppressant, drinking it before meals can make you feel fuller and therefore reduce your food intake. Health resource website WebMD states that drinking water before meals results in an average reduction in intake of 75 calories per meal. Drinking water before just one meal per day would cause you to ingest 27,000 fewer calories per year. Do the math: You&apos;d lose about eight pounds per year just from drinking water! Now imagine if you drank it before each meal. Ditch the sodas and juice and replace them with water to help you lose weight. If you think water tastes boring, add a slice of lemon. A glass of water with lemon is a recipe for successful weight loss because the pectin in lemons helps reduce food cravings. 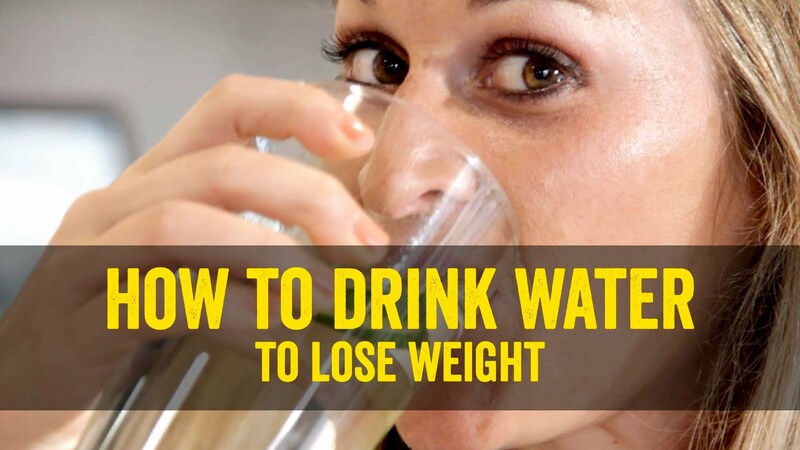 Think water doesn’t really help weight loss? Give up those sugary drinks for just a few weeks and see the difference. According to the editorial staff at WebMD, drinking ice cold water helps boost your metabolism because your body has to work harder to warm the water up, therefore burning more calories and helping you to lose weight. Plus, ice cold water is just so much more refreshing than water that’s room temperature. Because drinking water helps prevent muscle cramping and keeps your joints lubricated, you can work out longer and harder. Just another way keeping hydrated with water helps you lose weight. If you really want the water you drink to help you lose weight, you should follow the “8x8” rule recommended by most nutritionists: Drink eight 8-ounce glasses of water per day for weight loss and to maintain an ideal weight. You might need to drink more water if you exercise a lot or sweat heavily, or less water if you drink other beverages like herbal tea (make sure they are decaffeinated). Trent Nessler, PT, DPT, MPT, managing director of Baptist Sports Medicine in Nashville, says the amount of water you need depends on your size, weight and activity level. He adds that you should try to drink between half an ounce and an ounce of water for each pound you weigh, every day. How do you know if you’re getting enough water? A general rule is to check the toilet after you’ve gone to the bathroom. You’ll know you’re well hydrated if your urine is clear or very light yellow in color. The darker your urine, the more water you need to drink, especially if weight loss is your goal.